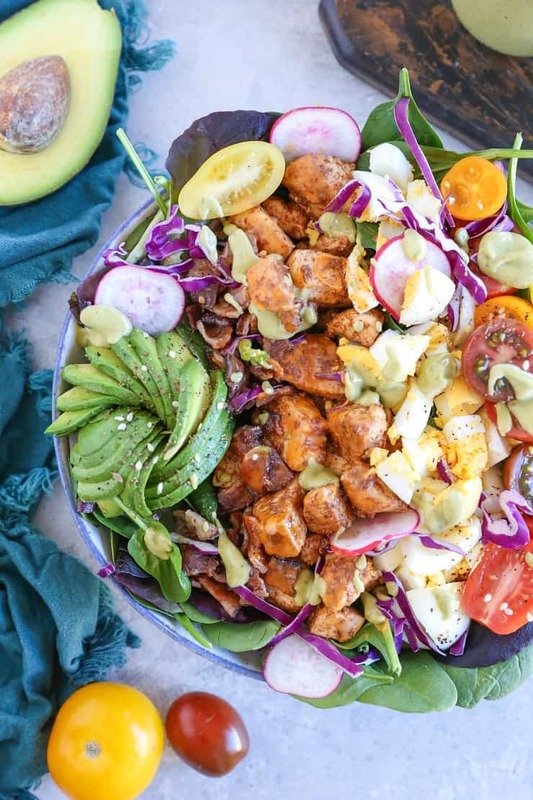 Fresh and vibrant California-style cobb salad with a spicy chipotle ranch dressing. Made with fresh California avocado, the ranch dressing is a healthier option to keep your salads squeaky clean. This time of year, when the weather gets warmer and we have more daylight hours, I begin craving big, fresh, filling salads. There’s something so satisfying about a meal that satisfies, while staying light and nutritious. 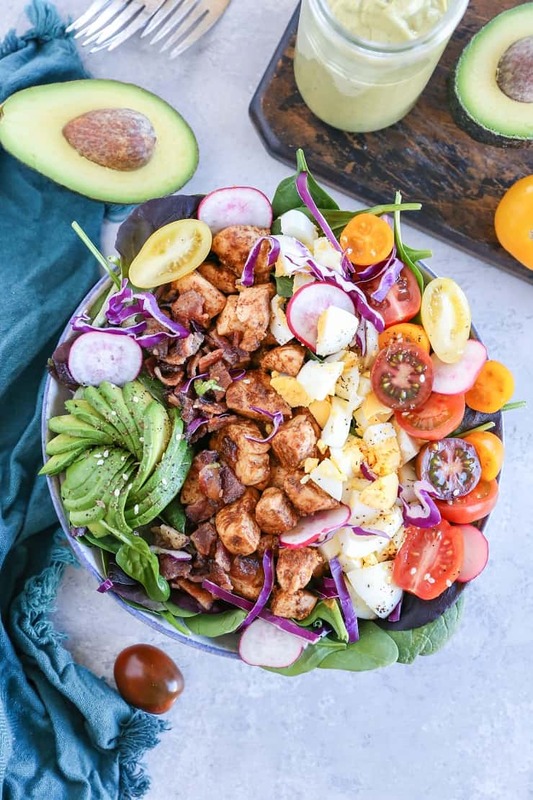 I have a salad for you that fits that exact bill – a classic Cobb salad with a California spin and a few tweaks to keep it cleaner than your typical Cobb. 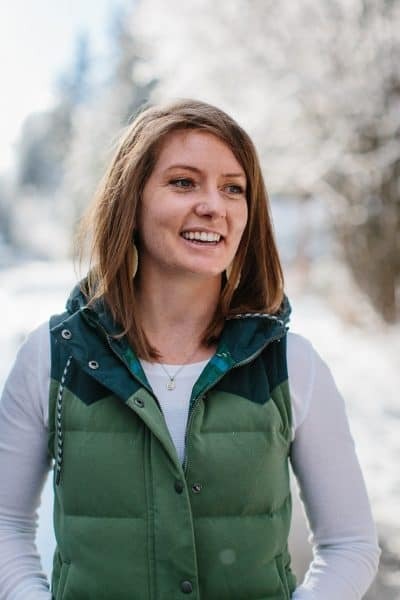 I’m partnering with the California Avocado Commission to bring you avocado-themed recipes each month for the next six months. This month’s theme is iconic California recipes. When I think of California cuisine, I think fresh, colorful, and lots of flavor with a little kick. 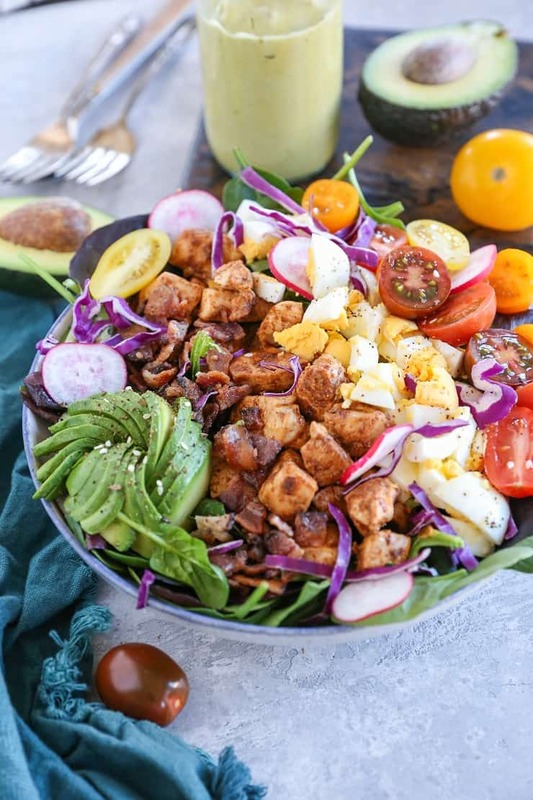 This California cobb salad hits so many bases. 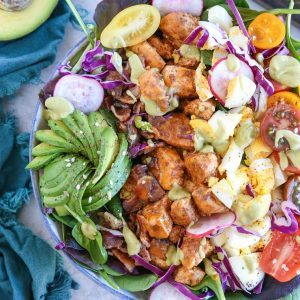 It’s packed with protein (hello chicken, bacon, and hard boiled egg), nutritious vegetables, and delicious avocado. 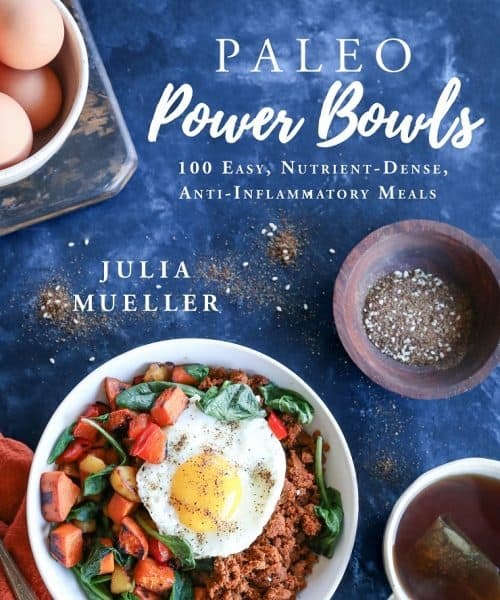 I kept the whole salad dairy-free and paleo/whole30 friendly. Lettuce discuss this chipotle avocado ranch dressing situation, because lemme just tell you: game.change.er. For the avocado ranch dressing, I use a California avocado instead of mayonnaise to keep it clean and full of healthy fats. 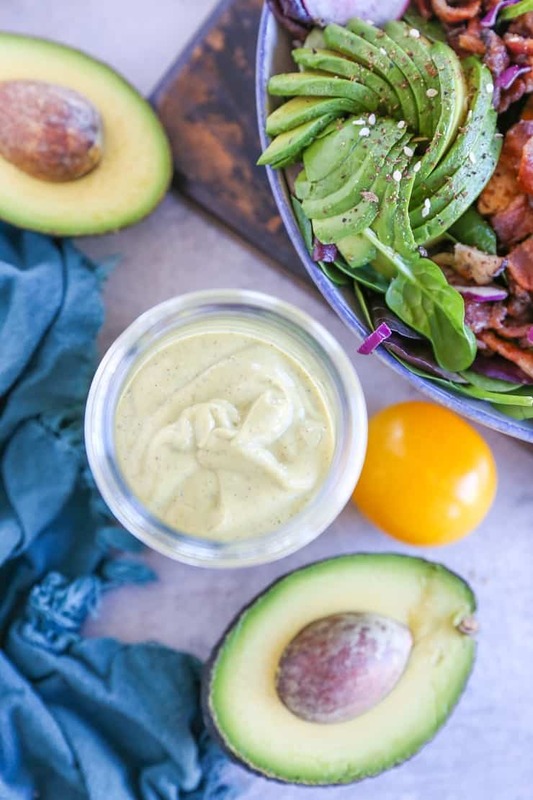 The avocado keeps it tasting fresh, while lending a nice creamy texture to the dressing. I add chipotle powder for some spice, turning up the flavor profile on the salad. You can adjust the spice level up or down to taste, and obviously feel free to apply this dressing to any of your favorite salads. The chicken portion of this salad is pretty epic. I simply chop a chicken breast and cook it in a skillet with coconut oil and chili powder…BOOM! SO much flavor with very little effort. If you like extra spice, consider adding a little hot sauce to the chicken during the cooking process. Use any of your favorite greens, such as kale, spinach, or romaine in place of the spring greens. Replace the chicken with steak or seared ahi. Add feta or gorgonzola cheese. Incorporate additional vegetables, like carrot or green or red onion. Omit the chipotle powder from the dressing to keep it mild. Get that avocado ranch dressing! Add ingredients for the chipotle ranch dressing to a small blender and blend until completely smooth. Refrigerate until ready to use. Heat the oil over medium heat in a skillet and add the chopped chicken. Sprinkle with chili powder and sea salt. Cook, stirring occasionally, until chicken has cooked through, about 5 to 8 minutes. Remove from heat and set aside. Divide greens among two to three salad bowls, and arrange remaining salad ingredients on top (including cooked chicken). Drizzle with desired amount of chipotle ranch dressing and serve. I am always looking for recipies that include the cal. carb. fat. protein , etc. count at the end. PLEASE make this available with your recipies. What can be substituted for the coconut milk?